One of the absolute thrills of childhood is racing from the car to the playgrounds at the park. From slides to monkey bars to swings, there was always so much variety to what you could play with and the exhilaration of being outside and actively using your body. Many kids, my daughter included, throw an absolute tantrum when it’s time to go home. But what if you could bring the playground to the backyard? My toddler is addicted to being outdoors. But until we bought a backyard playground, she was a bit limited on what activities she could do. I spent hours researching the top playgrounds. Now, she can spend hours and hours burning through energy and having a great time–all from the safety of our home. 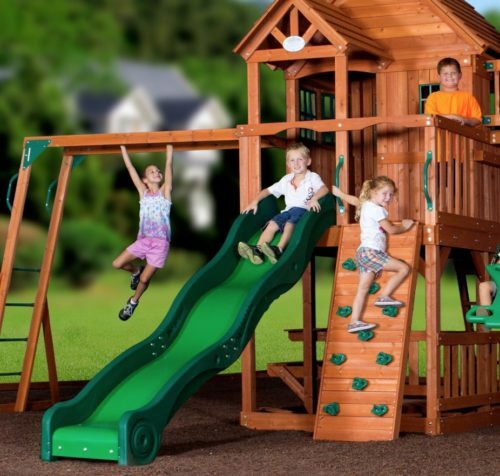 A word to the wise, a killer backyard playground set will make your house the place to be in the neighborhood. More friends for my kids to play with? That sounds like a win to me! In this post, I will review three incredible backyard playground sets that will guarantee that your kids are having fun. They all contain the essentials for a good day of play with important variations. Before making a decision, be sure to measure your backyard or play space. Many of these backyard playgrounds are fairly large and you need to make sure that not only will the playground fit but that you’re okay with the amount of space that’s left over. Nobody wants their kid’s feet to hit the back door every time they swing! The most impressive backyard playground covered below is sure to be a neighborhood hit. 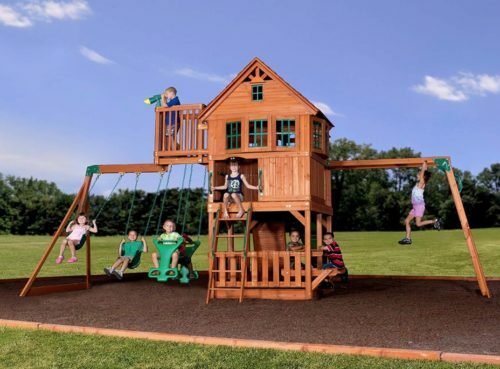 The Backyard Discovery Skyfort II Swing Set is massive and is designed for both physical play and a healthy imagination. Next, the Swing-N-Slide Outing Play Set condenses many of the staples of a good backyard playground while still providing variety for the kids. Finally, the Flexible Flyer Swing Set is our budget pick. It has a variety of play items without decorative flair or climbing spaces. The Backyard Discovery Skyfort II playground is The Godfather of backyard playgrounds. I highly recommend setting this up while the kids are away and watching their jaws drop to the floor in awe when they find this playground in the backyard. I particularly love this set because there is such a variety of activities for kids to do from the physical to the imaginative. This is also the only set that includes a little picnic table as a part of the playground. Not all kids enjoy the activeness of monkey bars and slides and therefore will enjoy being able to climb up into the tower or sit with their friends at the table. 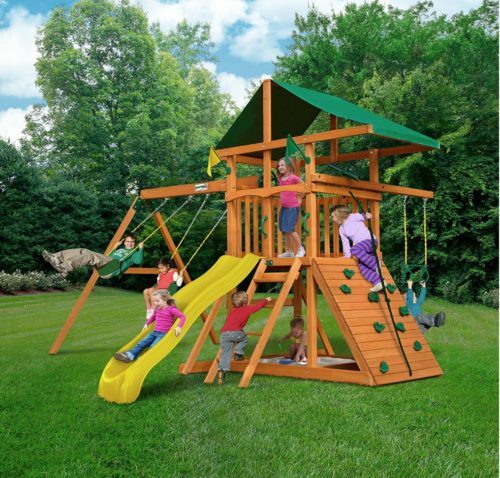 This backyard playground set is all about adventure. The multi-dimensional platforms are great for climbing or hiding during games of hide-and-go-seek. If your child loves playing ‘pirate’ then look no further than this set. The Backyard Discovery Skyfort II includes a crow’s nest balcony and lookout telescope. It will truly bring their imagination to life. My daughter loves to slide and the 10’ wave slide included is perfect for a quick return to the ground. We also do a lot of lunches outside during mild weather. The built-in picnic table is a great space where my children can enjoy fresh air while eating. 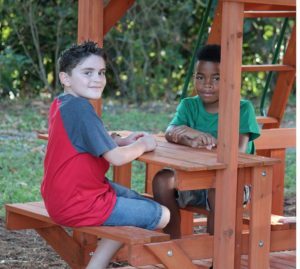 When the weather isn’t mild, there are parts of this backyard playground that provide great shade including the tower, picnic table area, and sandbox. The kids are still happy to be able to go outside and I feel better that they’re out of the direct sunlight. Monkey bars are always a huge hit at the park but rarely found on smaller playgrounds. Kids love being able to swing from bar to bar to test their endurance before leaping to the ground. Essentially, the variety of activities makes this a hit with the kids! As a parent, I understand that outdoor play is an important part of my child’s development. I’m also comfortable admitting that if my daughter exhausts herself playing outside, then bedtime is so much easier. The Backyard Discovery Skyfort II Playground will allow your children to express themselves creatively, build physical stamina, and have a whole lot of fun in the process. 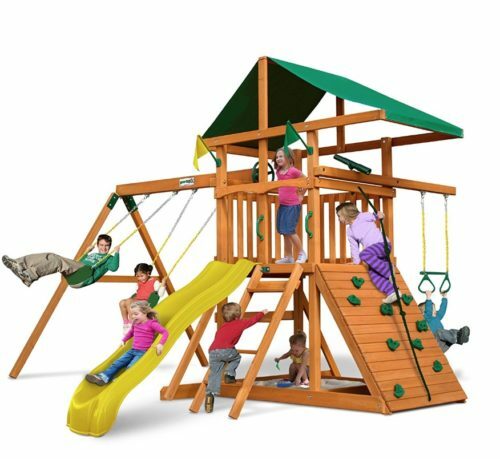 If you have multiple children, this playground set is also great because many kids can play on it at one time. There are two regular swings and the glider. This means four children can be swinging at the same time (and nobody is whining about it being their turn). At the same time, kids can be playing on monkey bars, in the sandbox, and so on. Additionally, this backyard playground set is really beautiful. If you’re going to invest in something that’s going to take up a significant amount of space in your yard, church, community center, etc. it’s vital that it be aesthetically pleasing. The cedar wood is gorgeous and professionally crafted. Green is used as an accent color for the slide, handles, gliders, and a few other parts that all look great against the wood. Grab handles are installed above the rock climbing wall. This allows children to have a firm handhold when pulling themselves onto the playset. They can also use these metal bars to stay balanced as they climb the rocks. The monkey bars and ladder which lead up to the first rung are secured. So while children are playing they will not flex or roll but rather remain sturdy. This playground set is made up of 100% cedar. Because of this, it will not easily develop cracks and weaknesses the way that other types of wood are prone to do. The cedar used for this playground is also rot resistant. The swing beam is made from steel clam-shell brackets. This ensures that the swing stays in place while children are playing. There is also a special powder coating used on the metal parts to protect them from the elements. The hardware included with this set is called Safe-T-Fuse. The nuts lock once in place and resist loosening over time. There are also no harsh edges to prevent children from snagging their clothes on the hardware. The Backyard Discovery Skyfort II Playground meets international ASTM standards for safety. Before purchasing this backyard playground, be sure to have a full understanding of what you’re in for by measuring your play space and comparing it to the dimensions of this product. The overall dimensions are 21’ 11” x 16’ 8 ½” with a height of 12’. However, it’s recommended to create a safe play zone on the outside perimeter of the backyard playground in order to prevent children from becoming hurt. This perimeter should start at 6’ from the playset and span 33’ 11” x 28’ 8 ½”. Essentially, take into account the entire area you will need for children to safely play on the backyard playground, not only the dimensions of the product. If your family is looking for a smaller set that still packs in a lot of fun, the Swing-N-Slide Outing Play Set may be just right for you. 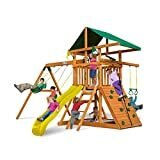 This playground has more of a square-like shape than the Backyard Discovery Skyfort yet still includes a slide, trapeze bar, rock climbing wall, small tower, sandbox, and accessories. Your kids and their friends will be able to run and play to their heart’s desire. Similar to the Backyard Discovery Playground, the Swing-N-Slide has a variety of activities for kids to do. Do your children love to build sandcastles and return to the house with locks full of sand? No problem. Or perhaps they’re ready to hang off of anything and everything that they can reach? With the trapeze bar and rock wall, they can do just that. Space for imagination is also built into this playground. Kids can play with the steering wheel and pretend to be the captain of a wayward ship. They also have a built-in telescope to watch out for an impending enemy attack. And in the end, they can rest easy once reaching the sandbox beach. What fun! I really appreciate that this backyard playground has most of the variety of the previous set while taking up less space. It also includes a large heavy duty canopy to protect kids from direct sunlight. This provides me peace of mind during hot summer days when I worry about my kids getting overheated. I can’t always convince them to come inside but at least I know that they can find some refuge (while supplying plenty of cold water). I do miss that this set doesn’t have the picnic table like the Backyard Discovery Playground, but it’s honestly no big deal to purchase a kid-sized picnic table to add to the backyard. One benefit that this set has over the previous one is that the swings are spaced out further. Made of Cedar to resist rotting and decay. The swing set chains are covered with UV protected plastic which keeps the chains cool and prevents cute little fingers from getting pinched. Meets international ASTM safety standards. Safety handles are installed above the ladder to give kids something to hold onto for balance and to pull themselves up to the platform. The dimensions of this backyard playground are 13’ 6” W x 10’ 6” H x 13’ D. This is a bit smaller than the Backyard Discovery Skyfort playset which is great if you are more limited on space. However, as before, do make sure that you’re leaving enough extra space on the perimeter for your children to be able to play safely. You should also keep in mind that any low hanging trees may need to be trimmed if you think that they might interfere with the height of the playground. Additionally, the play deck is about 4’ high and is made up by a 4’ x 4’ platform. The Flexible Flyer playground definitely doesn’t have all of the bells and whistles of the Backyard Discovery and Swing-N-Slide sets. But, it is still a great option for families with a tighter budget. Kids will have a great time with their friends playing on the see-saw, air glider, swings and more! This backyard playground is great for kids for a number of reasons. 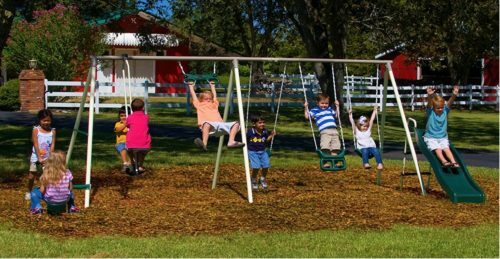 It includes all of the most important and classic playground features such as the see-saw and swings with additional cool features like the air glider. Since everyone is playing close together, it’s easy for kids to talk, sing, and babble with one another while zooming around. There are also two different 2-person activities (the see-saw and air glider) which is great for siblings or friends. The Flexible Flyer playground, unlike the Swing-N-Slide and Backyard Discovery, has a really awesome swing that kids stand in the footholds while swinging. This is a ton of fun and pretty unique! While the lack of a sandbox and climbing platform may be a bummer for kids, it could be a boon to parents. No sandbox means no combing sand out of my daughter’s hair during bath time which, thanks to the sandbox at daycare, is a daily occurrence at my house. Those of you with children who prefer to jump rather than use stairs or a climbing wall may also find relief in the fact that there is no tall platform for them to practice that skill. I also like that since this backyard playground isn’t made out of wood, you don’t have to worry about restaining every so often or kids getting splinters. As long as you do some general maintenance, this inclusive set should last you a long time. The frame uses powder coat paint which contributes to the strength and durability of the overall set. All of the parts are UV protected and less likely to fade. The chains for the swings and other features are vinyl covered to prevent discomfort and pinching. The Flexible Flyer playground is made in the USA. While it lacks in height, it makes up for it in length. Overall, it is much smaller than the other two playgrounds. Be sure to measure your space and to leave a safe perimeter for kids to play. The overall dimensions are roughly 18’L x 11’W x 6’H. Buying a backyard playground may be one of the best gifts you can give your kids. Not only will they have a blast playing, but just having the playground in the backyard will encourage them to spend more time outside doing a physical activity than they might usually. Whether you go with the Backyard Discovery, Swing-N-Slide, or Flexible Flyer playground, you won’t regret this decision. Make it a family affair by firing up the grill and enjoying a beautiful afternoon with the kids. Q: What age is this product suitable for? Q: What is the weight limit for this set? Q: What is the shipping weight for this set? This entry was posted in In Depth Product Reviews and tagged backyard, home, playground. Bookmark the permalink.